Servicing a rapidly growing city in Texas, located 28 miles north of Dallas, this K-12 school district has doubled in size since 1986. The district has a total of 22,000 enrolled students across their sixteen elementary schools, three middles schools, one freshman center and one high school. With over 19,800 student and teacher workstations, close to 1,900 computers in administrative offices, and over 2,000 tablets, the school district maintains a major investment in their network infrastructure and computing technology. Providing connectivity to the district’s workstations is a sophisticated fiber and Ethernet network, connecting each of the 21 school facilities and both a primary and back-up data center facility. Connectivity to the Internet is accomplished using advanced network filtering and anti-virus systems located in district’s data centers, ensuring the students have a safe and productive educational experience. 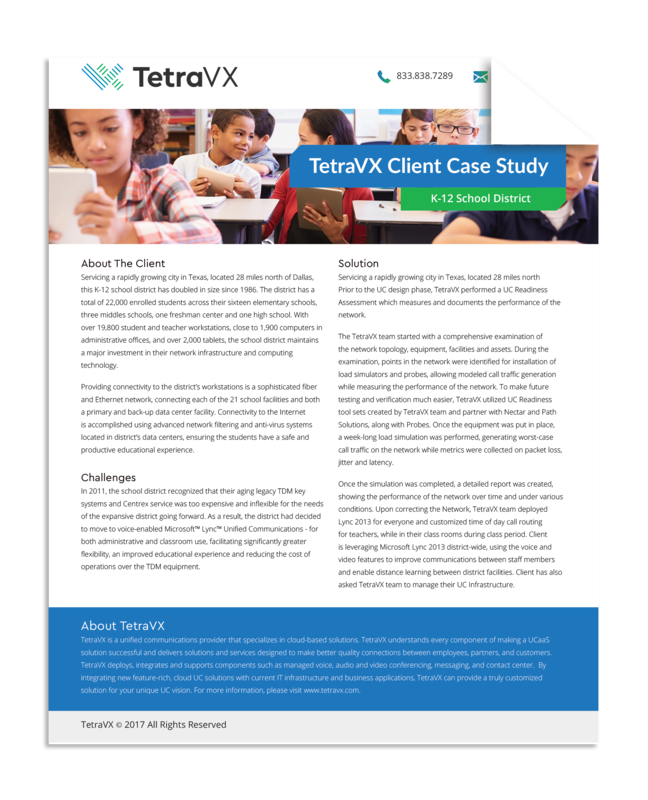 Download this case study to learn more about this client’s challenges and the solutions TetraVX provided.